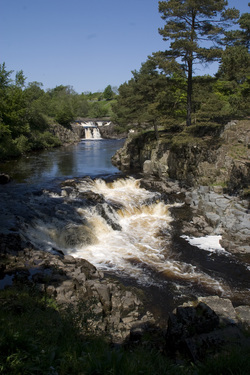 Summary - A walk with an impressive view of High Force waterfall, the largest waterfall in England, also following the Tees down to Low Force with its gentle falls, past Bowlees visitor centre, then up an old carriageway and back to the hotel. Summary - A walk along a beautiful section of the Upper Tees Vally, following the ridge of High Hearth Edge with the fascinating Moking Hearth Cave and its superb views of Cronkley Fell, Mickle Fell, Meldon Hill and Cross Fell, before returning with a gentle stroll along the banks of the Tees and Harwood Beck. Keep your eyes open for the famous Teesdale Spring Gentian. Summary - A walk along Teesdales old railway line and quiet country lanes and tracks over Romaldkirk Moor with far reaching views of Teesdale and beyond. The walk starts and finishes in Mickleton but can easily be adapted to start and finish from Romaldkirk. Summary - A walk passing Low Force with its gentle falls. With views of Holwick Scars on left and Middleton Common ahead, past Bowlees visitor centre, visiting Summerhill Force and Gibson's Cave and then through meadows back over the Tees to the inn.